The Snowy Owl (Bubo scandiacus), also known as the Arctic Owl, or Great White Owl, is a beautiful, majestic bird of prey that is well-suited for the cold arctic regions they inhabit, ranging across the northern regions of Greenland, Scandinavia, Russia, Alaska and Canada. Their feathers have no pigment, leaving more space for air, which is an excellent insulator, helping them to keep warm (and cool) as needed for their climate. The female plumage is more visually decorative, speckled with thin horizontal bars or spots, however, the male's spectacular plumage is almost purely white. 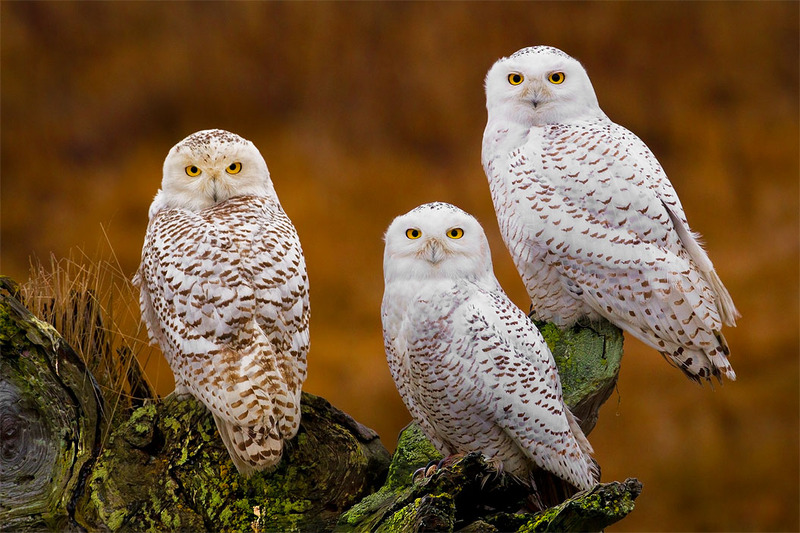 Snowy owls are known to sit still and silent for long hours, waiting for their prey — with lemmings being a favorite. An adult owl can eat 3-5 lemmings a day (up to 1,600 per year). This photograph captures a rare occurrence of three females that have amicably perched together. One reason for this cautious tolerance is because the food source is plentiful and there is less competition...for the moment.